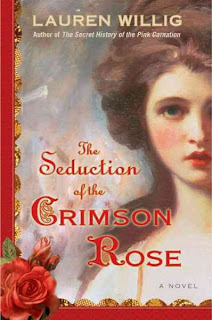 Every so often a review will be posted to this blog reviewing a book or series which lends itself to the lighter side. Ya know, the books you don't really want to admit to reading, claiming instead to be most of the way through Crime and Punishment, which is, of course, very engaging and hasn't been sitting on your bedside table for the last year with only ten pages actually read. Yeah, I'm talking about the books that keep you laughing all the way through. You may not have learned anything particularly complicated or discovered the meaning of life in their not so lengthy set of pages. But you remember the fun you had reading every word. How the book kept you coming back for every new laugh. The Lighter Side will suggest a new book or series to tickle your fancy and bring you hours of enjoyment. 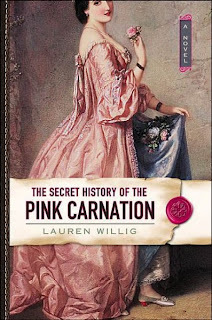 The Secret History of the Pink Carnation by Lauren Willig. Ah, the world of spies, espionage and...flowers? 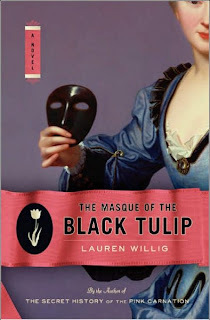 Welcome to the world of the nineteenth century, where a spy seems to grow out of every garden. Eloise Kelly is a Ph.D. candidate at Harvard University working on her thesis...and running out of time. 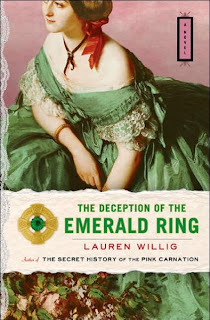 She has traveled to not so sunny London to dig through the dusty tomes housed in the dark recesses of the British Library searching for some hint, scribbled side note, or random ink blob which might hint at the identity of one of England's most historically elusive nineteenth century spies...the Pink Carnation. Eloise has vowed, to herself if not necessarily her thesis committee, to be the historian who finally reveals the identity of the carnation. However, when sneezing her way through the dusty tomes of the British Library only leads to a perpetual squint and a seemingly permanent hunched posture, Eloise goes for broke and appeals to the descendants of on of the known spies, Lord Selwick, the Purple Gentian. Who knows what treasure she might find hidden in the inaccessible reaches of the descendants' archives? Or what might lie in the heart of the descendant himself? Follow Eloise's trail, as she winds through numerous letters and journals, seeking the Carnation's true identity and humanity. 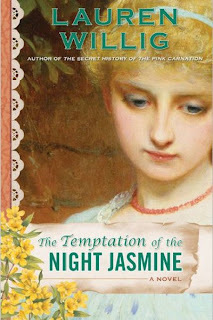 If you like the first one, follow Eloise on more garden spy adventures with her next four novels.